It’s definitely time to start thinking seriously about our first opponents in this year’s National Football League Division One campaign. It’s Monaghan we’re up against first and we play them at St Tiernach’s Park in Clones on Sunday where throw-in is set for 2pm. Meath’s David Gough is the man with the whistle for this one. We played Monaghan in the first round of the League last year and so, in the indolent world of League fixture planning, it’s the Farney lads we open this year’s campaign against too, only this time we have to travel to their gaff. They beat us by two points in the corresponding fixture at MacHale Park twelve months ago but the year before that we emerged from Clones with the points, thanks in no small part to two late long-range frees converted by Robbie Hennelly. After our first round encounter last year, Monaghan went on to enjoy (and endure) a rather similar spring campaign to our own. They ended up, like us, on eight points (along with eventual winners Kerry and Donegal) but they finished ahead of us in in the table, in fourth spot, due to a superior points difference. This is how their seven League matches went. 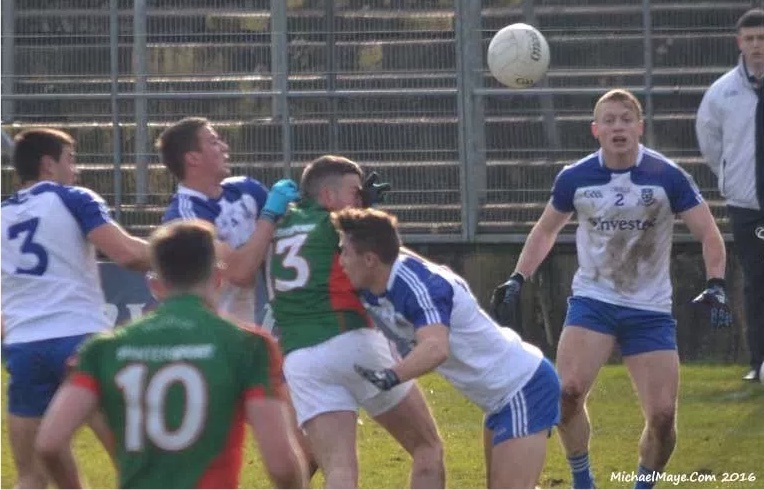 Having beaten us in Round 1, they played out a cagey draw – seven points apiece – against neighbours Cavan but they followed this up with a wonderful win down in Killarney over Kerry. That 2-8 to 1-10 victory saw them top the table after three rounds of matches. Tyrone, as they’ve so often done to the Farneymen, brought them down to earth in the next round, however, beating them by 0-14 to 0-10 in Omagh at the start of March. Top tier survival was more or less assured two weeks later, though, when they thumped Roscommon by 2-17 to 1-13 in Iniskeen, in the process pushing the Rossies closer to the drop. Another draw against Ulster opposition followed – this time a 1-11 each result against Donegal in Ballyshannon – before they tackled Dublin in the final round, back home in Clones. They gave a good account of themselves against the still unbeaten Dubs that day in early April and led by three points with 15 minutes left to play but a late Dublin surge proved decisive as Monaghan fell to a 2-15 to 1-15 defeat. The following month they began their Ulster championship campaign with a preliminary round clash against Fermanagh in Clones. That one was always going the one way, with Monaghan easing to a 1-20 to 1-11 win at the finish. It was tighter when they faced Cavan in the provincial quarter-final in mid-June at Breffni Park but the visitors emerged from that one with a win as well, coming out on top by 1-15 to 0-15. 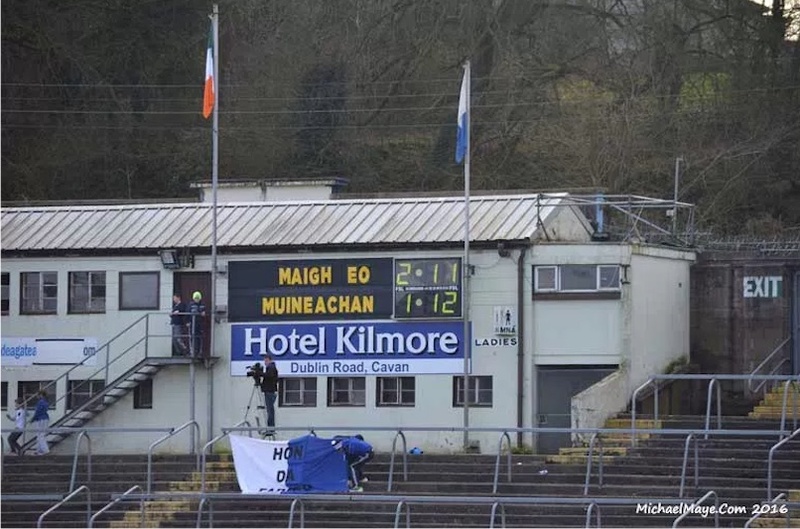 Monaghan came unstuck in the semi-final, though, when a confident Down team ripped into them at the Athletic Grounds and sent them crashing out of the Ulster championship on a scoreline of 1-14 to 0-15. Our defeat to Galway two weeks before then was a bigger upset but Monaghan’s loss to the Mourne County was still one of the few shock results of the early part of the summer. It always helps to get a soft draw in the qualifiers and Monaghan certainly got that by pulling Wexford in Round 2B. A 3-23 to 1-11 victory over the Model County duly followed in Wexford Park in early July, following which Lady Luck smiled at them once more when they were paired with Carlow in the third round. 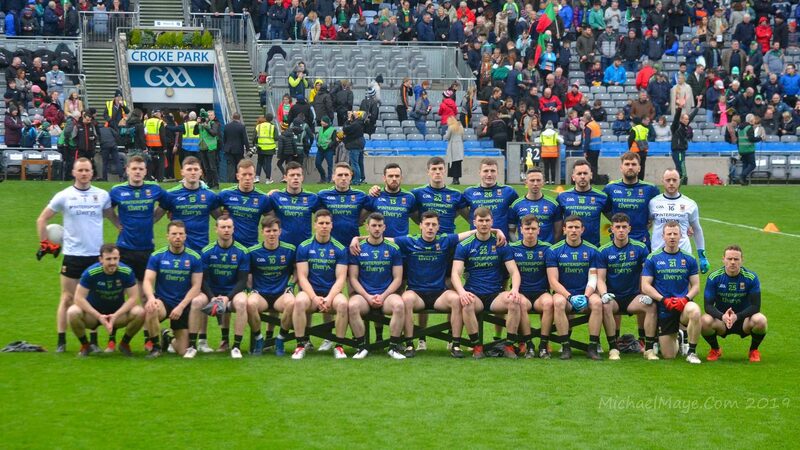 The plucky Barrowsiders had, by then, been bigged up as some kind of fairytale of the championship – largely on the back of their success in keeping their losing margin to Dublin to respectable proportions – but Monaghan had few problems in getting by them. They came out of Dr Cullen Park with a 1-12 to 1-7 win. Then, as so frequently happens to many counties in the championship nowadays, came a Round 4 reckoning against their provincial conquerors. Having bested Monaghan, the Mourne lads had then taken a bit of a whipping against Tyrone in the Ulster final and so they had more of a hang-dog mien about them when they squared up for their second summer joust with the Farneymen. This time the venue was Croke Park. Monaghan were well ready for their Northern opponents on this occasion and they had eight points to spare over them – winning by 1-24 to 1-16 – to seal a place in the All-Ireland Series for the fourth time in five years. They were no match in the quarters, however, for Dublin who obliterated Malachy O’Rourke’s side by 1-19 to 0-12 on what was, by any measure, a dismal day for the lads from the drumlins. But sure that was only summer football. No doubt the Monaghan lads have been tearing up the trees in training ever since and will come out of the traps at us like a bunch of wild hoors in Clones the next day. That is, after all, the Ulster template. The bookies can’t make up their minds on this one. We’re narrow favourites at 10/11 with Paddy Power but, as we all know, odds on League games can be, well, a bit odd. I suppose there’s money to be made (or lost) at that price. There’s also a game to be won or lost. Let’s haul the poll thingy out of storage, then, to finish up and see what the mood is about our opening fixture in this spring campaign. How will we do against Monaghan? Can’t see Mayo win this game. Mayo will not be able to establish any foothold from either kickouts. …. theirs or our own. Might be a long day fof our defense. Rise Again. Do you know the Mayo team line out? You would be very surprised what kickouts Mayo would win. I’m sure S R has a plan. Good to see that Mick Rock is gone from the Connacht council. We were drawn against Galway every year under his 3 year term. We’ll do well to get a win above in Clones, but then again it’s games like this we win in the league and lose the nailed on home ties. The entire squad are just back from holidays. (well deserved by the way). It will take a few weeks for them to get going. Div 1 survival is the goal as usual. Monaghan Tyrone and Donegal need early points going by their past records. They will tough opposition in the early rounds. I read that article Liam. I’m happy these anomalies are out there for all to.see. It’s a shame to see favouritism shown to any county and these different fundings should be cut to match what the rest of the country receive. While I’m hoping for a good start to the league on Sunday I’m thinking we’ll do very well to come home with any points. I’ve often been wrong before but feel there is too much of the spine of the team that won’t be available. 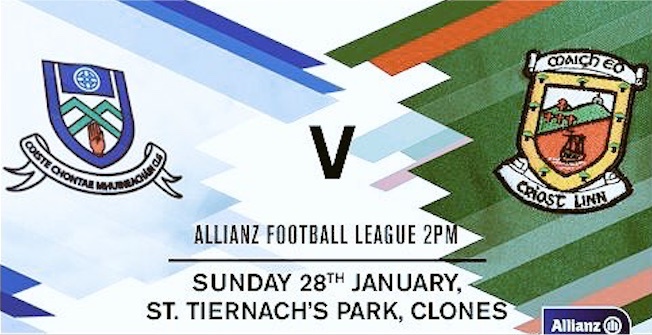 Best of luck to all the lads and hope they put in a good display to kick off the year. Would seriously experiment with our team for first 4/5 games, if we win a game or two then brilliant (Monaghan game is a good opportunity with the two Hughes brothers meant to be out), if we get a hiding or two then so be it, at least then we know who’s cut out for it, introduce few of our big name players then for the last games v Tyrone and Donegal and survive by skin of our teeth would do just fine. anyone good tips on where to park sunday please ? I don’t buy into the 3 games in a row theory. If Regan and Freeman got 3 or 4 games pre play off I think they would be very happy with that. Not likely though. Too much competition and management needs to look at likely championship players in the league. Most players might only get 2 or 3 starts bar Kevin Mc who seems to be played almost every game despite being totally proven as a top performer. Douglas could do a playmaker job in half forwards though more useful in the scoring zone and Kirby seems a very good passer spraying accurate balls across the pitch. Comments on Nally and Akram.. I think Nally would be wasted in half backs as his no 1 attribute is distribution which suggests midfield or half forward would be better rather than having him chasing speedy forwards. Akram I think was a half forward as a minor and really isn’t going to make half backs unless an injury to the 3 who hold the jersey not even factoring in Donie who seems to love big pitches like Croker. Question is are any of our forwards vulnerable to being replaced and yes I think Cillian from play and Diarmaid are. Most people think it unthinkable to drop Cillian but are any of the replacement free takers as reliable as 2017 Cillian (J Doc, Freeman, Gallagher, Loftus, COS, Andy). I would hazard a guess one or 2 might be even in pressure. We saw what J Doc did on a big pressure day v Kerry. I can see where you are coming from re Nally, would like to see him at midfield for a spell also, not so sure about him or Akram in the half forward line though. I just think if Akram could get a good run together and get good game time he’d be an amazing asset to bring off the bench last 20mins of a game, imagine him v Kevin McManamon last 20mins of an all Ireland final, free’s up someone like Paddy Durcan for us this who’s well able to take a score. Eyesonyheball, just had a look through your team. Besides Connor Loftus who featured last year the other 14 would be lads that didn’t feature last year. It just goes to show that maybe we have a much deeper squad than any of us thought. Now I know this is by no means Mayo’s top tier but I like the way your thinking. They have to be tried to be trusted and maybe it’s time to try them at league level for a game or 2 at least. It’d bring some of them on an awful lot. Can’t see Cillian being dropped TBH, too important of a player, takes on a shot or two that he shouldn’t every now and again but then again at least he has the balls to do so and makes some v intelligent runs that free up a lot of space for our runners. Would love to see DOC to rediscover his form of 2015, as previously suggested he might be worth a look at midfield, although I’d question his high fielding ability (I think the long kick will be crucial in 2018). Think there’s 2 starting spots up for grabs in the forwards this season, Reape, Loftus, Treacy, Freeman to battle it out for them in my opinion. Agreed Liam, just read the Ewan McKenna article in the Indo. UNBELIEVABLE stuff. Its beginning to look like we might need to grab 2 away wins against the relegation fodder (Galway and Kildare). Then take out Tyrone in Mchale and then cementing our place in division 1 on the last day with a nailed on guaranteed draw away against “The Hills”. Finishing on 7 owl pints. Playing Kerry early is no bad thing either and we have a chance of taking them out too. Bearing in mind we played them off the park two weekends running last August. In addition to the massive allocation that Dublin Gaa receives from Croke Park, the incoming Gaa President is a Dublin man and a member of a Dublin Gaa club. Surely all other counties will be up against it this year. If there’s a better forward in the county who’s going to come and take Cillian’s place on the team, I haven’t seen him anyway. Eyesontheball, two starting spots up for grabs in the forwards? Cillian, Jason, Kevin, Aido, & Andy are dead certs to start in the championship if all are fit. Duirmuid I think will have a stormer of a season, so I dont think two starting spots are up for grabs. We do need Loftus and Reape to push hard and be ready to do a job off the bench. I do have a feeling Durcan will be tried out at hf for the league at least, Rochford needs to find a way for Keegan, Boyle, Barrett and Durcan to all start (all are too good to sit on a bench for most of the game). Duirmuid to mf may free up a spot at hf for Paddy. What do posters think of young Ciaran Treacy from Ballina , can he kick with both feet? Height? Martin Carney said he was the find of the FBD on the Connacht telegraph.Hopefully Rochy gives him his debut Sunday. Might be a controversial statement, but I think Stephen Rochford and Andy need to sit down and look at what is needed to win an All Ireland. Dublin killed us last year with EXPERIENCED lads off the bench. They started the younger guys and had Connolly and McMenaman to bring on when the heat was on. We were the opposite, only Paddy Durcan could be called an “experienced” sub for us. We need to play some of the younger guys all the way through. I know Andy pulled us out of the fire along the way last year, but he won’t be around forever. I’d love to see Loftus and Nally starting regularly in the Championship this year, with Boyler and Andy coming on with 20/25 mins to go, adding that bit of steel, skill and know how. I’m just afraid we’ll keep doing the same thing we did last year which was almost, but not quite, good enough. Even though the likes of Colm and Andy want to start every match, they need to sit down and look at what strategy would best help the team to get over the line. I think that’s developing the younger lads to start and springing the older and wiser guys from the bench. Would like to see Kirby part of the squad on Sunday – will need his kind of strength and presence around the middle section if we are to compete there. However, I believe he may be carrying an injury of late so that may potentially rule him out of the reckoning. Will be very interesting to see the team selection tonight. This will be a hard one for us .Monaghan will be a lot fitter and sharper and I think we will be more rusty and struggle at mid field and getting decent ball into forward line. I hope Rocheford gives decent game time to some of younger lads give them a taste of serious attrition that Monaghan will surely bring. @Bruce, I would agree with you there. Start with the young lad and finish with the experienced player is the best policy to pursue. For example in the Monaghan game last year in the league, the Galway and drawn Roscommon games in the championship, inexperienced lads missed chances to get us over the line. If you had experienced lads to take those chances that would seem to be the better option to take. In relation to the Ewan McKenna article, its crazy really that the GAA aren’t doing something to level the playing field in terms of the allocation of funds. Surely they have to wake up and smell the coffee sometime! Dublin’s hollow Allirelands are going to get much hollower before the gaa take action. The only thing that will cause change is if the Hill crowd finally decide that united/ city or whoever at 4 o’clock are more important than thrashing Meath or Kildare in Croker at 3.30. A half empty hill will cause the gaa to think a bit about what they’ve done. Best of luck to Mayo this weekend, hope that treacy and Douglas get a good run in this one. R.HENNELLY, B.HARRISON, G.MCDONAGH, E O DONOGHUE. S.NALLY, P,DURCAN, C,BOYLE, A,O SHEA (capt) D OCONNOR, K. MCLOUGHLIN, D,KIRBY, C.LOFTUS, J.DOHERTY. N,DOUGLAS. C.TREACY. I hope C.OCONNOR will be well enough to play part of the match. Here`s to a successful 2018. I think some of Ye need to stop the obsession with Dublin’s advantages or perceived advantages. It has not stripped us going toe to toe with them and we should have closed out at least one All Ireland so we need to look in he mirror. U think winning Connacht back and going through the front door has to be the number 1 target ghis year. I think we got tired towards the end of the final last year and when that happens concentration levels drop….those long detours through the back can catch up and I don’t fancy our chances if we have travel that route for a third year in a row…less games the better. At his age I couldn’t see Andy starting for us this year. Anything we get from ANdy will be a bonus. No one should expect him to make anything like the contribution he made last year. Wouldn’t agree that we played Kerry off the park in first semifinal last year. Remember we were the team that had to kick the equaliser deep in injury time after Kerry messed up a free in midfield. Excited again as league upon us. Lots places up for grabs due to injury list. So I can see interesting selection for Sunday. We’re always expecting a few new faces to appear and who knows it just could happen. I was at few fbd games leitrim and Galway respectively. In both games Shane nally stood out. When he was taken off we shipped goals as sort of fell apart. His time now has come to push his way into the team as I believe he has a lot to offer albeit that he lacks pace. He reads games well and offers a great left foot. I’d plant him at midfield on Sunday. Ger macdonagh was nnamed player of the year so I feel he may start on Sunday at full back. I don’t believe going all out with new comers is complete answer. A blend of youth and experience would suffice. Alot of posters are not too confident about our chances on Sunday. Our injury list plus a few other issues may warrant that view. But for me I’d always say we can win. We must be arrogant in our approach to games. Any spare tickets for Sunday ? Some posters appear to be getting a bit carried away here. The team named to start by eyesontheball above is not even our second team, and would likely be devoured by an experienced Monaghan side with all the newcomers unfairly looking very foolish. We need to target a win on Sunday as the 2 new sides in the division are better than the 2 relegated last year. I’d look at starting a moderately experienced side next Sunday with 2 or 3 newbies maximum. Likes of o’donoghue and Treacy appear to be in a good position to get a chance after the FBD while Shane Nally is another good prospect for 2018. It will be a war of attrition on Sunday and a loss would see us under pressure going into Kerry game. As for the people suggesting we drop Cillian, I’ve never heard such nonsense in my life. The same cillian who kicked 3 from play in last years final off the great Philly??? Who’s on the verge of becoming the highest championship scorer in the history of the gaa with seven or eight years still ahead of him? Get real please! There isn’t a team in Ireland that COC wouldn’t start on. Bruce… Paddy Durcan started the 2017 All Ireland final for Mayo…He was not listed as a starter on the official programme, Diarmuid O Connor was, but did not in fact start the match. In my opinion, Diarmuid was our most effective substitute.. In fact Paddy Durcan has started 3 All Ireland finals for Mayo if you include the 2016 replay… But to be honest, the Dublin bench was much better than Mayo’s on the day… However if the match had been reffed fairly, Mayo would be far too much in front for the Dublin substitutes to close the gap! We still have to get full back sorted out. The other backs are all stars. The forwards are where we really need to see new blood. Loftus must be a shoe in to start this year. Mcloughlin, Doherty, A. o’shea and Cillian and 1 other with Loftus. Diarmuid as an impact sub with Andy. Then you have reagen, treacy freeman maybe akram and reape. Need to get a starter from these 5. We’ll have plenty of mixes to cover midfield. Full back is the big position to fill. Hope we have a plan for that. All in all We’ll be sound for the championship but sunday is another story. Good luck to them all. There’s no team really that play a 3 man FF line anymore. Usually there are 2 left up and 1 who drops deep to link the play (Jason did this for us). I think people get a bit hung up on having a 6′ 2” big full back when in fact it’s not necessary. For example, I could see Harrison being our #3 this year if Eoin O’Donoghue is playing well at corner back. Also, people hoping for a completely experimental 15 starting against Monaghan need a reality check. This is division 1 football. An experienced Monaghan side ripping a young team to shreds would be of no benefit to anyone. Proposed club fixture plan for 2018 announced last night, details on mayo news website. First round championship April 7/8, second round earliest end of august and could be end of September, 11 league games, 8 of them starred ( no county players). One of the three unstarred games is two weeks before Galway game. People really should stop doubting COC. Look up Maurice Walsh photography and you will find a clip of his best bits in a mayo shirt. He is one of the best. Okay we are short a few lads for the start of the league but it might help to introduce a few new lads but while still being competitive. James I agree and those two kicks from the sideline at either end down in Cork a few years ago to keep us in Division 1 were as sublime as I’ve ever seen. One man I have heard no talk on is Conor Loftus…is he injured? Loftus came off the bench last weekend so presume he’s available. He’s playing Sigerson for DIT next Wednesday so probably best not to over play him if possible. I cant see how dropping Cillian OConnor is any kind of solution. He scores consistently and is well on his way to be leading scorer ever. We want to drop him. Paul Galvin pointed out last year how we have hom cover too much ground ie he drops back to Full Back line at times compare that to Rock for Dublin who never goes beyond midfield. I heard McConville say the same. Galvin was pointing this out in terms of him missing late frees ie he was knackered. People need to stop obsessing over Andy’s age, the chief reason that Mayo were better last year was that Moran started and was out “out” man for long ball. He was effective previously as an impact sub and can be again but in the white heat of championship, nobody comes close to winning as much 50/50 ball and using it wisely, therefore giving us a foothold in games. Mayo class to shine through in Clones today lads, don’t worry! I for one would like to see Shane Nally replace Coen, an big Barry to come in for JG at half time. See ye in Clones, Maigh Eo Abu!